This Friday, October 2nd, Dean & Britta's record label Double Feature will be hosting a release party for the new album by My Robot Friend. The party is at 92Y Tribeca in NYC and kicks off at 9pm. Featuring sets from My Robot Friend and (Double Feature recording artist) Cheval Sombre (with Dean & Britta sitting in) as well as a DJ set by Dean Wareham. Tickets are $10. 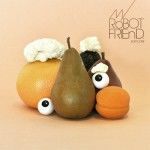 The new My Robot Friend album Soft Core will be released by Double Feature on 13 October and features contributions from Dean Wareham and Alison Moyet. You can currently stream the complete album on Soundcloud (or right here on A Head Full of Wishes! ).